Another one of my first cards as a design team member for GCD Studios starts the May Throwback Tuesday’s off! The deets: every Tuesday, I will post a card that has been sitting in the draft closet too long. At the end of each month, I will randomly select a winner from all the valid challenge entries!The challenge: link up an old papercraft related blog post, card photo, or post one of your old drafts/pictures! An additional entry will be given to those who comment on the Throwback Tuesday posts for that month.The prize: a big ol’ box stuffed with scrapbooking goodies!Sorry, but due to crazy expensive shipping costs, this challenge is open to the US only! I know you can’t feel this card, so I’ll just go ahead and tell you that the butterfly is sparkly, and those white buttons are fuzzy. Oh yes, fuzzy. And that, my friends, completes my first GCD Studios technique assignment…and this months first Throwback Tuesday! 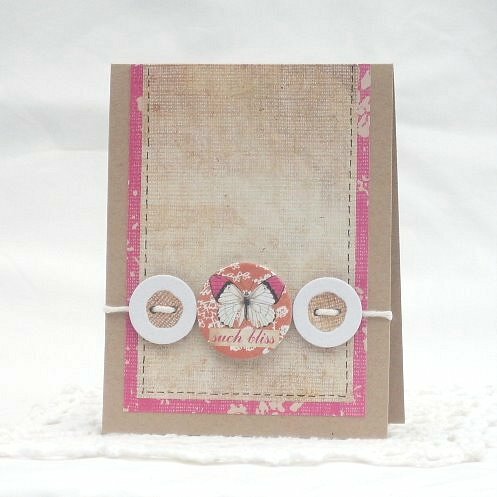 I have these cardstock circles from Melody Ross, love what you did with the buttons! I love this CAS card Clare especially the colors and the butterfly 'button':-)! You clever crafter! Love your ingenious idea with the DIY buttons! Beautiful work, my friend!